The other big issue is austerity. 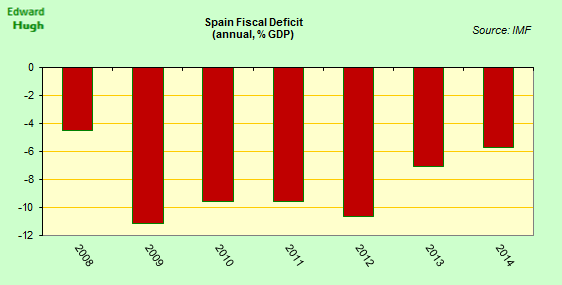 Spain still runs a large fiscal deficit – 5.6% of GDP in 2014 – the largest in the Euro Area. At first glance, with so many elections taking place it doesn’t seem likely this will come down that much this year, and in 2016 it is hard to imagine there won’t be a parliamentary majority in favour of prioritizing bringing down unemployment over reducing the deficit, making some sort of clash with the EU commission not improbable. Nevertheless, as long as ECB QE stays in place investors are hardly going to worry too much so yields wouldn’t necessarily be affected. But what if the ECB wanted to taper? 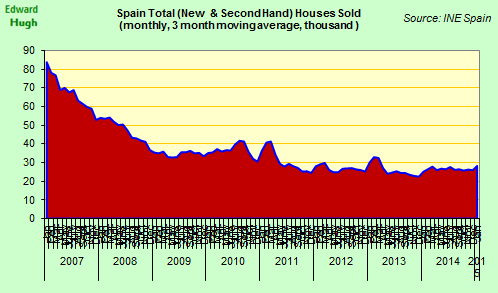 More than an economic phenomenon, Spain’s property boom was a demographic one. 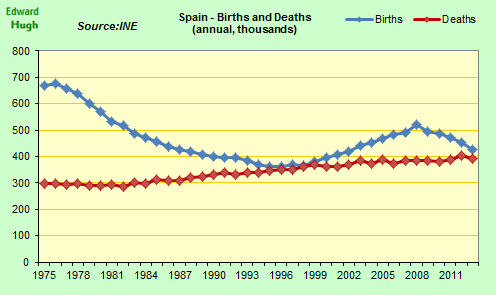 Since births only just exceeded deaths, between 1980 and 2000 Spain’s population rose slowly, by just over 2 million people. Then between 2000 and 2009 it suddenly surged by 7 million. This was almost entirely due to immigration, with workers coming to the country from all over the globe attracted by the booming jobs market. Then in 2008 the boom came to an abrupt end, and unemployment went through the roof causing the trend to reverse. Since 2010 more people have left the country every year than have arrived, with the consequence that the population is now falling. Given that in 2015 the statistics office forecast that for the first time deaths will exceed births, it is most likely that this decline will continue and continue. In fact the overall migration number – a net 251 thousand people emigrated in 2013 according to official data – only tells part of the story. 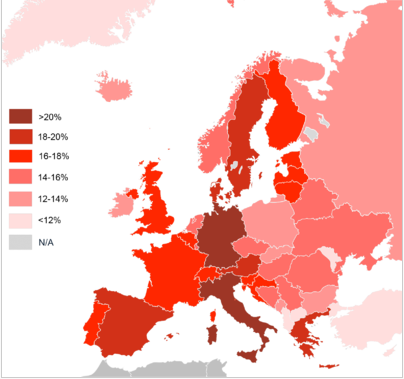 The majority of young Spanish people working abroad are not included in these numbers (unless they have explicitly informed the Spanish authorities they are leaving, and few do this, partly because they do not consider themselves “emigrants”), but just as importantly the net balance masks very large movements in both directions. According to the national statistics office over half a million people (532 thousand to be precise) emigrated from Spain in 2013, while 285 thousand people entered the country as immigrants. 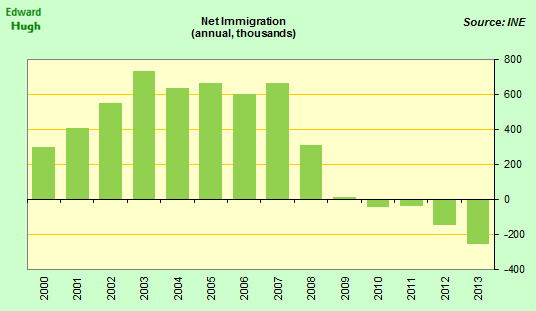 So the net migration statistic covers over what are really very large flows. 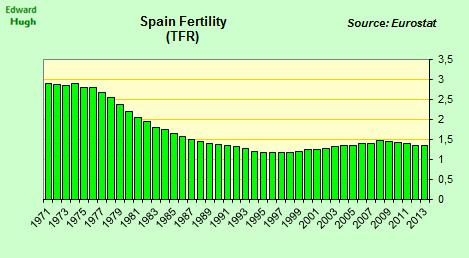 The number of annual births in Spain has been steadily falling since the mid 1970s. They accelerated again slightly in the first years of this century, partly due to the shadow effect of an earlier boom in the 1970s, and partly because the incoming immigrants had a slightly higher birth rate. Coinciding with the outbreak of the crisis births peaked again in 2008 (after an initial peak in 1976 – ie 32 years later, average age at first childbirth is now just above 30) , and now the statistics office forecast a continuous decline. 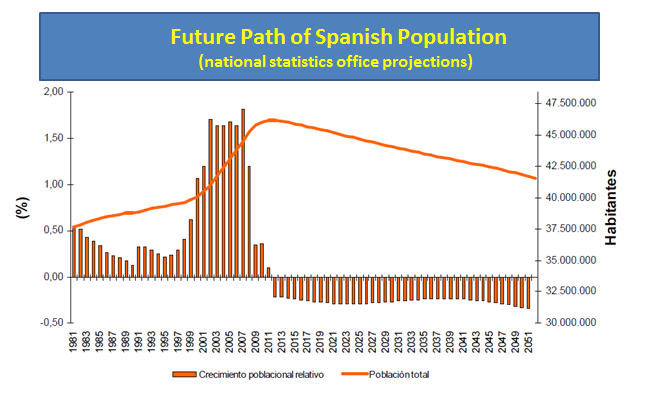 In their most recent long term population projections the national statistics office suggested that Spain’s population would fall to 41.6 million by 2052 (a 10% drop over current levels). While the number of over 80s rises sharply the number of people under 15 is forecast to fall to just over 5 million, a drop of about 25%. 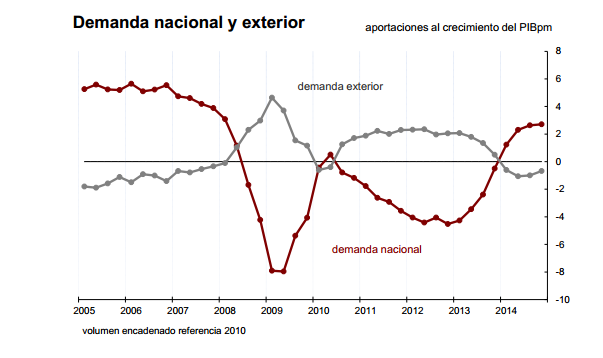 At present the rate of outward migration from Spain seems to be slowing as the economy starts to create jobs. But just how stable and sustainable is this trend? This is why the issue of whether or not Spain has taken enough measures to ensure a better longer term growth rate (a growth outlook which moves beyond picking the low lying fruit after the recession) becomes important. 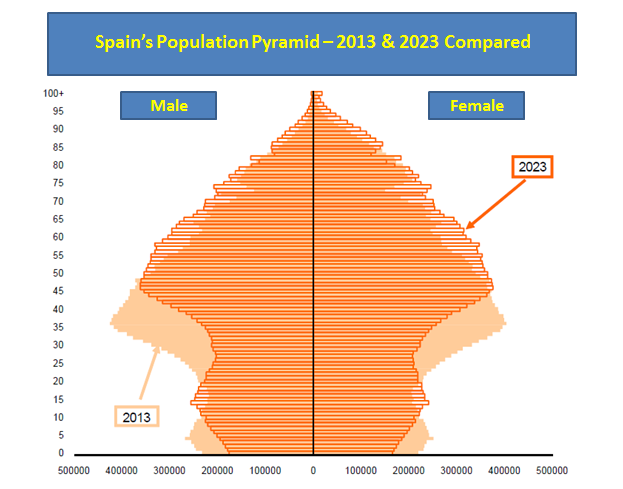 In the short term population projections published in November 2013 by the statistics office, Spain’s population was forecast to fall by 2.6 million (5.6% of the present population) over the 2013-2023 decade. The largest population decline was expected to be in the 20 to 49 age group, which was expected to fall by 4.7 million (or 22.7%). Whatever way you look at it this state of affairs is highly undesirable, and raises serious questions about the sustainability into the medium term of Spain’s current economic recovery. If the level of unemployment is “unacceptably” high, this is partly because of the damage it will do to Spain’s economic outlook in the longer term. But won’t they all come back? This is the answer I get time and time again. Such an outcome is far from guaranteed, even if it is what policymakers implicitly assume. As I am trying to suggest, whether those who are leaving come back or not depends on the state of the Spanish job market, and despite the fact jobs are now being created the size of the problem means the situation on the ground will remain difficult for many, many years to come. Some point to surveys, like the one shown in the chart below carried out by recruitment experts Hays, which show that a large majority of those leaving want to return. But wanting is not the same as being able. Few want to leave their home countries and their families to start a new life in a distant land, but many are now being forced to do so. Most initially don’t see themselves as emigrants, but as time passes there is a growing possibility that that is exactly what they will become. 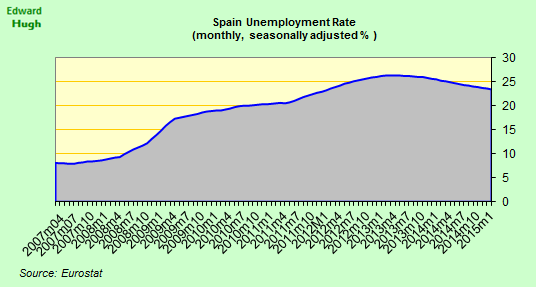 It is a simple fact that as Spain’s working age population falls so will the long term potential growth rate also fall. And if growth is lower, then new jobs will be less. 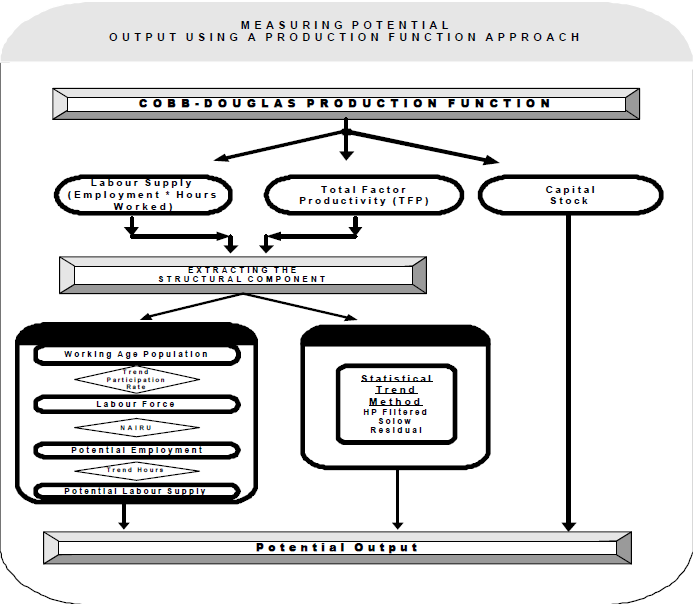 As can be seen in the diagram below (which illustrates how EU Commission calculates potential growth rates). There are three inputs which matter a) the existing capital stock, b) labour force growth (which is a function of working age population), and productivity. Now it is clear that as working age population turns negative (which basically happened in Spain around 2012) the dynamic also becomes negative for potential economic growth, and the only real hope of sustaining it in the longer term is via (total factor) productivity growth. 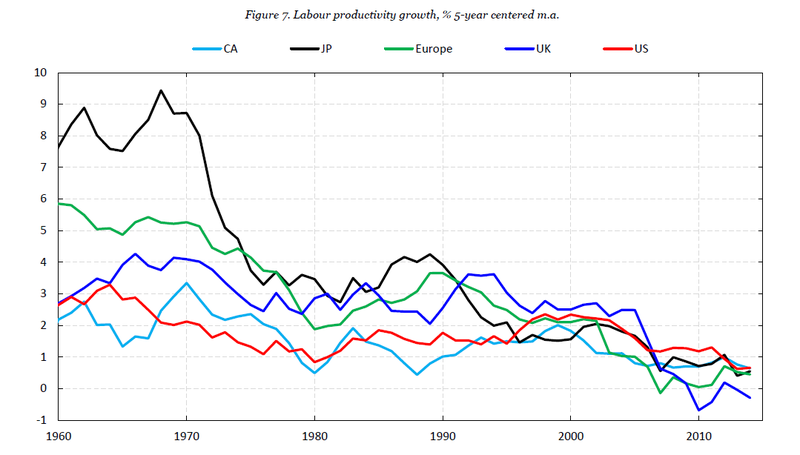 But this – the “oh well, we’ll raise productivity” argument – isn’t as easy as it seems. The following chart which was produced by Fulcrum research based on Conference Board and IMF data and shows clearly how the trend towards lower productivity growth in developed economies is now decades long. It simply isn’t credible to imagine that this trend is going to be turned around at the click of a finger. So one of the obvious consequences of this population loss is a permanent fall in the long run trend growth rate. This situation is concealed at the moment as the very high unemployment rate means that in the short term an above trend rate of growth is possible, but this favorable situation won’t last forever. During the boom years the fact that a very large “boom” cohort was in the household formation a group and then that a large number of immigrants arrived to set up their homes was a key factor in fueling the boom. 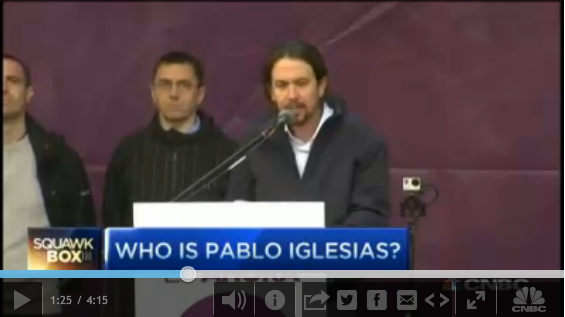 Spain’s pension system is on the rocks. Before the crisis it was running constant surpluses, but now the trend has reversed, and it is in constant deficit, and the shortfalls look set to stretch forwards as far as the eye can see. The curious detail about this situation is that even as the crisis deepens the government keeps raising the real value of pensions being paid. 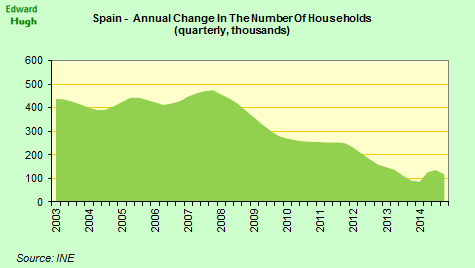 On the other hand household consumption is surging: it was up an annual 3.9% in the last three months of 2014, a phenomenon which is leading many to talk of “good deflation” in Spain. But what proponents of this argument tend to forget is that someone if paying for this “deflation boost” party. 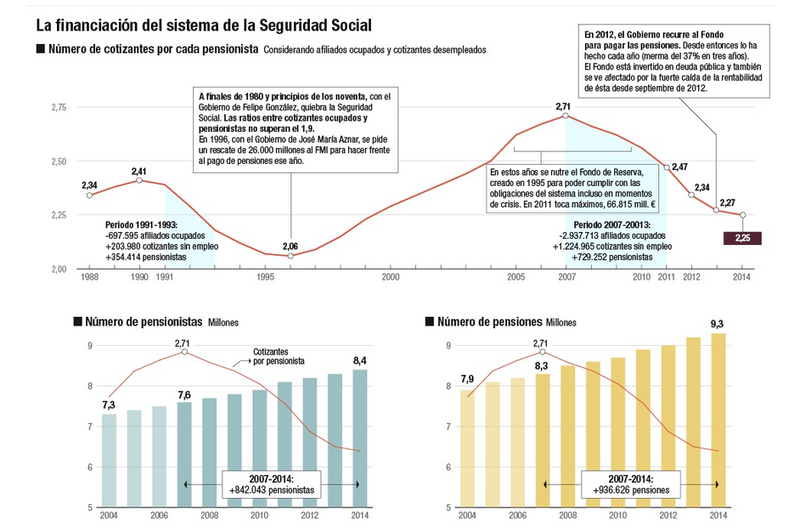 I the case of salaried workers the cost is carried by their employers, but in the case of pensioners the “fiesta” is being charged directly to the account of future generations of pensioners, as Spain’s mini boom becomes increasingly consumption driven. The fact that Spain’s pension system was going to have problem maintaining the level of payments has long been known. In fact in recent years there have been two reforms which have tried to address different aspects of the problem. But it is really the huge loss of employment during the crisis that has really highlighted the chronic nature of the underfunding the system is being subjected to. Initially the then socialist government plugged the growing funding gap out of general government finances, but as financial markets started to focus on the size of the country’s fiscal deficit this practice became increasingly problematic. With the arrival of the PP there was a change in strategy and since 2012 the pensions deficit has been funded by drawing down on the Reserve Fund. This was established in 2000 and was meant to ensure the long term sustainability of the system, especially as demographic pressure mounted towards the end of this decade. The Fund had been accumulating the surpluses generated in the 2000 – 2007 boom years. The attrition has been constant and the Fund is now starting to dwindle. In 2012 7 billion euros were withdrawn, in 2013 it was 11.6 billion euros and in 2014 15.3 billion euros (or 1.5% of GDP). If you want to compare apples with apples and pears with pears, you would need to add this 1.5% of GDP to the 5.6% fiscal deficit, giving a 7.1% deficit using the same accounting criteria as 2011. Put another way the deficit has really been reduced from 9.6% to 7.1% in 3 years, hardly dramatic austerity. Instead of paying the pensions gap out of current income the government are using a credit card issued by “future pensions” to keep payments up even though the situation is obviously getting worse, meaning it will be even more difficult to pay current pension levels in the future than it is now. As a result of all these withdrawals the size of the Reserve Fund has fallen from its 66.8 billion euro peak in 2011 to the current level of 41.6 billion euros. At the moment the government have budgeted for another 8.4 billion euro withdrawal this year, but this number could easily turn out to be larger. So 2015 should close with around 30 billion euros outstanding – about 3 years more money at the current rate. 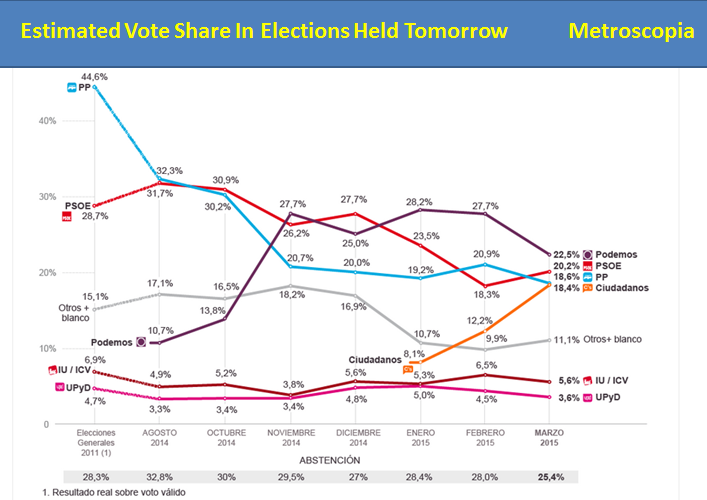 It is clear that soon after the election changes will have to be made. Even though the number of contributors to the system is growing as the employment situation improves the rate of spending is rising faster. There was a pension reform in 2013 which was intended to address the problem by making the system self financing. A complicated formula was introduced whose intention was to ensure that more money didn’t go out – on a structural basis – than came in. But this was in the era when Spaniards still expected inflation as their economic default setting. As a result – and as a way of selling the reform – a minimum increase of 0.25% was set. Last December consumer prices were down 1.5% over a year earlier, and as a result the minimum rise was a generous “vote winning” increase of 1.75% at a time when the system itself was running at a huge loss. Something similar will happen this year, giving at least one part of the explanation as to why retail sales are doing better – in part these increased sales are being paid for with future pensions. So now that people are finally moving from one Euro Area country to another in search of work the currency union is working better, isn’t it? As Nobel economist Robert Solow puts it in the quote with which I start this post, it is impossible to believe that the longer term path of an economy is unaffected by the trajectory taken during periods of deviation from trend – whether upwards or downwards. Emigration, and with it negative working age population dynamics, are being promoted by the ongoing labour market crisis in the worst affected countries. The question is just how far the longer term future of these countries is being put at risk by the form in which the adjustment is taking place. In allowing this to happen instead of addressing excessive indebtedness issues, are we simply replacing short term debt defaults with longer term pension and health system ones? Young people are moving from the weak economies on the periphery to the comparatively stronger ones in the core, or even out of an ever older EU altogether. This has the simple consequence that the fiscal deficit issues in the core are reduced, while pressures on those on the periphery are only liable to get worse as welfare systems become ever less affordable. Meanwhile, more and more young people could follow the lead of Gerard Depardieu and look for somewhere where there isn’t such a high fiscal burden, preferably where the elderly dependency ratio isn’t shooting up so fast. As often happens in economic matters, solutions to one problem are inadvertently promoting the creation of another. Avoiding radical debt restructuring on the periphery, and going for a “slowly slowly” correction doesn’t necessarily mean that all other things remain equal. The Euro is being held together by allowing unemployment rates to adjust towards a narrower range via population flows. 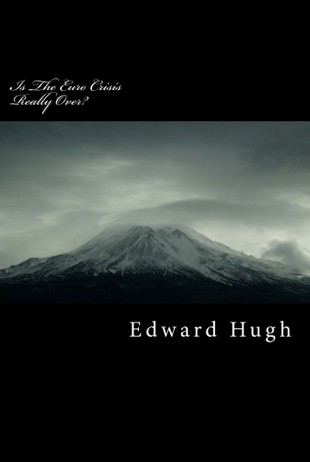 Many of the above arguments are developed in detail and at greater length in my recent book “Is The Euro Crisis Really Over? – will doing whatever it takes be enough” – on sale in various formats – including Kindle – at Amazon. 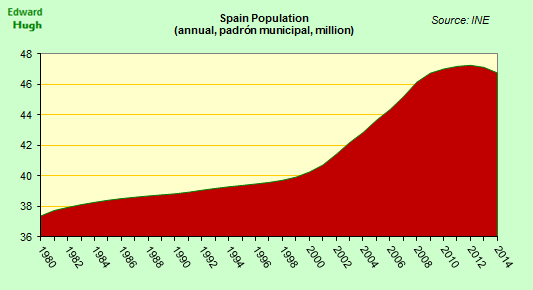 So Spain is like a less worse-off version of Estonia, at least demographically. In Estonia, deaths have exceeded births for years. Every year they announce which primary schools will close down due to lack of students. That’s an interesting view of the future. We will have countries like Ukraine which totally collapse demographically, we will have those like the Baltics which simply become unsustainable, and then those like Spain which are simple as less worse-off version of the very bad cases. Isn’t all that treating demography a bit like destiny? I bought, in 2000, a ‘casa de verano’ near Valencia. Just under an acre, with 1,500 sq ft of chalet plonked in the middle. 12.5 mio pesetas, so 75k euros . . . GBP/Euro at the time 1.75, so £50k with all transaction fees included. as a holiday home, which they had moved into, in retirement. They where getting on and so put their place, comparable to mine, on the market for 25 mio pesetas, or 150k euros, in 2006. A young Ecuadorian man who had married a Spanish woman, they had two young daughters, borrowed 110% of the asking price, bought it, and placed it with the same agency, the next day, for 215k euros. He told me that he hated Spain and that his plan was to flip the property, take his winnings back to Ecuador, with his young family and set himself up. He had a large black stencil of Che Guevara, on the back window of his car. He ended up being one of those people that were paid to go back home and not return for five years, after Lehman went bust. He never sold the place. They say that geography is destiny . . . but then so is psychogeography, even more so, I would say. My complements, Mr. Hugh, on this insightful article. I certainly agree with your conclusion that this is an economic problem and in a short forum such as this I realize that not all avenues can be explored but two things should be considered. First, the real estate bubble. The article does a good job summarizing the rise of births during the early part of the 2000s as property values soared with people looking for a place in the sun, most notably on the Costa del Sol. The widespread and unsustainable property values, mostly due to questionable banking and credit practices, gave a false boost to the economy along with a temporary deviation from the demographic trend. Just above the graph you clearly state ‘…and now the statistics office forecast a continuous decline. (in population)’ The next step is the logical result of a low birth rate which is the inability to sustain pensions and social services with an aging population. While the article clearly spells out the demographic transition, it does not move into the subject of immigration which most of Europe is now debating how to balance the need for younger, working age citizens while maintaining the identity and culture of a nation. Since the birth rate of immigrants, particularly muslim immigrants, is far higher than native births, it is fair to project a time when Spain, along with other EU neighbours, will actually have a Spanish ‘minority’. This may seem far off to some people but there are already numerous cities in Europe which no longer have a native majority in births so it is simply a matter of time. Demographics are destiny and you have done a good job summarizing this issue, Mr. Hugh. I look forward to reading your commentary again. Just one thing in a typical workmanlike post. Ed mentions labor mobility in the US versus Europe and mentions pensions etc. To me the largest barrier compared to the US is language. For the first time in my life, I recently had to interact with someone who doesn’t speak the only language I speak, the one I’m writing in. It is very frustrating. It is also kind of amazing how the same English is more or less understandable in such widespread areas. Many accents but not much basic difference. I don’t know how this compares to other languages. I admit I am puzzled by all the worry over reducing population. For years it seems we have been subjected to concerns about the effect of overpopulation plus the effect of of increasing automation resulting in less work for more people. This led to the thought that people voluntarily limiting their families was a good thing and a reduction in population likewise. i.e. Fewer people but the work being done by intelligent use of automatic machinery and information technology. Indeed in advanced countries this has already happened to a great extent and despite smaller families there is growing economic pain for people displaced by technology. Not many machine operators, drivers or junior administration staff can convert themselves into programmers or systems engineers. For that matter not all that many in these categories may be needed. The logical conclusion is that at some point all production and administration will be in establishments owned by the 1% or so and manned only by a few highly educated technicians and some cleaners. If a large number of people are thereby unemployed or otherwise having very low incomes, who will be left able to afford the wonderful hi-tech products being churned out by the wonderful machines and able to pay sufficient taxes to provide for governmental administration, education, defence and other services? The problem therefore is to alter the economic model so that a mainly automated economy is able to spread the wealth from production also among those who would seem to be excluded if present arrangements continue to apply. Obviously this is difficult! But the alternative is a return to a lot of 19th century misery, social disaffection and potential revolution. Those who ignore history are liable to have new bolshevik and/or fascist movements snapping at their heels. If Pickety is correct this scenario is exacerbated by the seemingly inexorable trend for the rich micro-minority to get ever richer. Indeed many writers and film makers have already explored this general theme with universally depressing stories set in a not too distant future. These days it is not easy to have a reflective turn of mind and be an optimist. Essentially the problems are not technical but almost entirely due to the nature of human nature. Philip Minchom – basically, all countries should strive to have a fertility rate right around 2 children born per woman. This would cause everyone’s population to stabilize, assuming limited immigration/emigration. In places like Sub-Saharan Africa, the fertility rates are well above 2.0, so they must work to reduce them. In Europe, they’re below that, so they must work to increase them. Having a rate above replacement level leads to unsustainable growth, while a rate below it means aging of the population and a faltering welfare state.